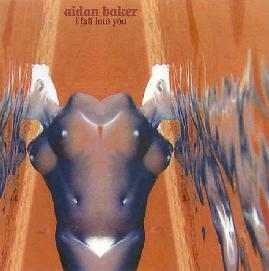 Aidan Baker - "I Fall Into You"
Aidan Baker is a Toronto based musician and writer who creates slowly unfolding, ultra-hypnotic soundscapes using electric and acoustic guitars, bass, tape loops and vocals. The CD opens with "Lapse", which consists of slowly drifting and shifting soundscapes, winding Frippoid guitarscape notes, and repetitive rhythmic patterns. "Symbiosis" begins with a spacey ambient folk feel with strumming acoustic guitar and light atmospheric drones. But Baker soon employs string scratching and plucking techniques to add color and character to his creation. Along with the ghostly voices, spoken word, and chirping birds he has painted a slowly rolling pastoral cosmic landscape. "Lethe" features the heaviest use of loops, as well as the most lush and almost symphonic drones heard on the album. The longest track, and the highlight of the album, is "Lysis", which treats of to gradually evolving soundscapes with spoken word contributions from Naomi Okabe. A throbbing high note serves as the foundation and mantra for our attention, while multiple ambient and drone elements weave their lazy way through the aether. The atmosphere is dark but hypnotic, and I found myself in a near trance, floating dreamily along as this 25 minute piece evolved. After a while drum patterns are introduced and the blend of these rocking rhythms with the drugged droning pace of the soundscapes is odd but intriguing. But soon the pace, volume and intensity increase, with ethereal voices, a strange sense of melody, and freaky bubbling sounds embellishing the main theme. Finally, Frippoid guitarscapes and loops are brought in which carry us through to the end. Overall, an enjoyable journey into a dark but mind-bending dreamland. You can visit Aidan Baker's web site at: http://www.listen.to/aidan. There's lots of info here about Baker's music and written works.